What followed was a rapid rise into professional football. In 2008, he was signed by Rayo's reserves, also in the Tercera. However, his talent earned him a loan move to Segunda B side Navalcarnero in the second half of the 2008-09 season and going on to be regularly used in a relegation-ending campaign. And he did not have to wait long for his Segunda debut. 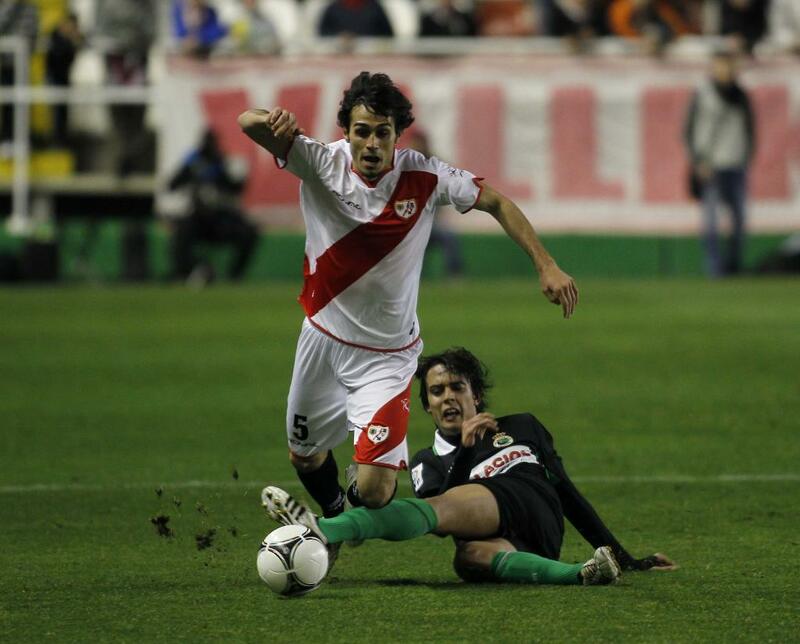 During the 2009-10 campaign, Arribas helped Rayo B to promotion to the Segunda B. On the 3rd of January, 2010, Pepe Mel was faced with a double blow within two minutes. In a fixture at home against Levante, center-back Salva was sent off in the 44th minute, and center-back Sergio Pelegrín was faced with an injury just a minute later. At half time, Pepe Mel summoned the only two reinforcements on the bench, his third-choice center back and a Rayo B player with no professional experience. 22-year-old Rafa García and 19-year-old Arribas came onto the pitch. And apart from a few nervy moments where Levante striker Rubén Suárez was able to beat the offside trap, Arribas performed well under the weight of expectation. Manuel Tena's injury and José Serrano's exclusion from Pepe Mel's led some to speculate that Arribas could be given more time to shine. But his additional contributions to the 2009-10 campaign totaled just one game - the full 90 minutes in a 2-3 loss to Cartagena in which he netted a goal too. Nevertheless, he became an automatic first-choice (38 games out of 42) the following season as Rayo returned to La Liga after eight years, in a heroic season when Rayo's staff often went months without being paid. And at the age of 22, he had become a La Liga player. No, a La Liga starter. Arribas was a first team player in Rayo's La Liga campaign, starting in all of his 34 league appearances as the capital outskirts side narrowly avoided relegation. Arribas finally had his destiny in his pockets. In late June 2012, free agent Arribas signed a three-year contract with Osasuna. He would play there for two seasons, clocking 70 appearances in two top flight campaigns which eventually ended in relegation. But top flight clubs knew he was too good for second division football again, and Sevilla swooped in to sign the defender. He played 18 games across all competitions in his only season, including three in the Europa League group stage as his team won the competition for the second time in a row. Unai Emery's constant rotation at the back left Arribas behind, and in June 2015 he signed a four year contract with a club that wouldn't see him as a bit-part player: Deportivo de La Coruña. The club were so eager to sign him that they gave him a four-year contract - unusual for a club that constantly battles relegation. And he duly rewarded the club with 31 appearances, and even two goals, as the club ended the season with a 15th-place finish. However, in the 2016-17 campaign, new coach Gaizka Garitano saw him the was Unai Emery saw him - and it was only after his sacking 23 games in that Arribas regained his starting spot in the team, courtesy of, surprise surprise, Pepe Mel. He would play 13 out of a possible 15 games under the coach that gave him his first ever break, helping the side comfortably, if nervously, avoid relegation. Things seemed to be chugging along nicely for the central defender. It is only this season that things have gone astray. Pepe Mel gave him three games this season but was himself sacked after just nine games. And new coach Cristóbal Parralo has completely frozen him out, and Arribas has done no-one any favors by getting into an argument with Florin Andone in training. And so, last month, Arribas took a risk - he moved abroad for the first time in his career. The 28-year-old has joined Mexican top-flight outfit Club Universidad Nacional. So far, his career has only seen steady rise and steady consistency. And the slightest setback has either made him a blowhard who collapses at the first sign of gunfire. Or another example of getting an opportunity out of nowhere.